= Print selling below its original issue price. = Print selling at its original issue price. = Artist Proof. The print is denoted by the abbreviation AP. = Size of art print. Daniel's Answer to the King by Briton Rivière depicts Daniel looking up to the King of Persia while being imprisoned in a lion's den. 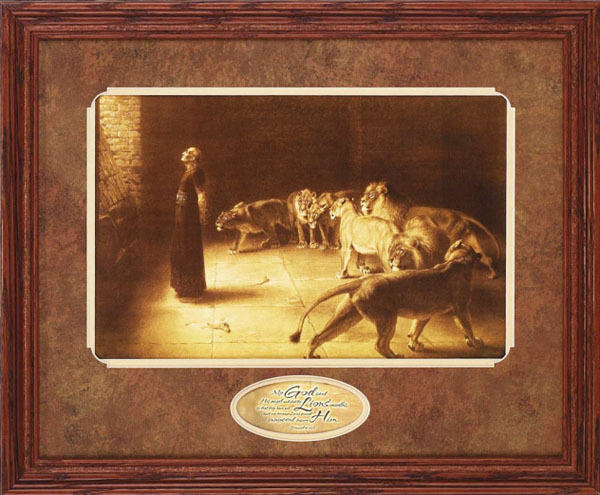 This highly sought print is the same image seen on the Charles Stanley program which aired in October 1999. 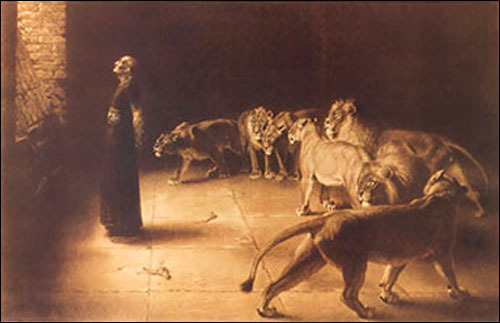 "And when he came to the den, he cried with a lamentable voice unto Daniel: and the king spake and said to Daniel, O Daniel, servant of the living God, is thy God, whom thou servest continually, able to deliver thee from the lions?" This print was issued & released in 18**. Image Size: 4.5" x 6.5"
Image Size: 10.5" x 16"
Framed Size: 16" x 20"
This item comes in an English walnut frame with a marbled mocha mat. "My God sent His angel and shut the Lions' mouths, so that they have not hurt me, because I was found innocent before Him." 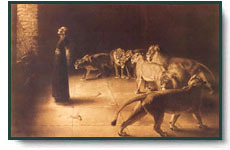 Daniel's Answer to the King copyright© 18** by Briton Rivière and is prohibited from being copied. All applicable copyright© laws apply and are reserved by Christ-Centered Mall, Inc. Web pages copyright© 1998-2010. All Rights Reserved.